During its ten wartime Patrols, the personnel of U-47 changed continually. The aim of this section of the site if to be able to present the complete crew lists for all of its patrols. So far there are two such lists, those who took part in the raid on Scapa Flow and the names of those men who were not to survive U-47's final mission in March 1941. In building this site I have sought information far and wide, and over the last two years have received welcome assistance from a number of helpful fellow U-47 and U-boat enthusiasts. However, the crew lists for the remaining eight patrols have remained elusive. If anyone can assist me with this project, it would be very much appreciated; please drop us an e-mail if you might have any helpful information. 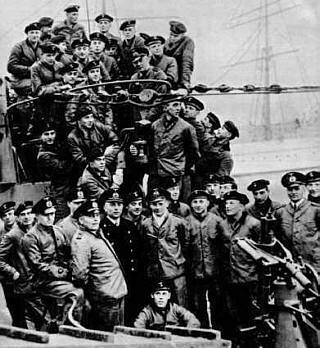 A photograph of the triumphant crew of U-47 following the successful attack on the Royal Oak at Scapa Flow in October 1939. The skipper Günther Prien is standing in the dark uniform in the front row. To view the crew lists, just click on any of the links below. With each list, you can click on certain crew members to get a more detailed biographical portrait.